How to watch Baby Geniuses (1999) on Netflix Netherlands! Sorry, Baby Geniuses is not available on Dutch Netflix, but you can unlock it right now in the Netherlands and start watching! With a few simple steps you can change your Netflix region to a country like New Zealand and start watching New Zealand Netflix, which includes Baby Geniuses. We'll keep checking Netflix Netherlands for Baby Geniuses, and this page will be updated with any changes. 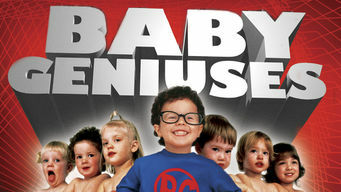 Baby Geniuses is not available in Netherlands BUT it can be unlocked and viewed! Two evil adults try to exploit babies who are born with knowledge of the universe's secrets -- and can speak to each other in a secret language. Guess what? Babies know everything. And they're determined to stop two evil scientists from cracking their code! There is a way to watch Baby Geniuses in the Netherlands, even though it isn't currently available on Netflix locally. What you need is a system that lets you change your Netflix country. With a few simple steps you can be watching Baby Geniuses and thousands of other titles!